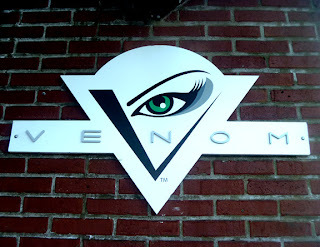 Update: Venom closed Sep. 2, 2011. Not that I stood out as an old white guy with no striped shirt and no product in my hair, but a young black woman who was a total stranger stepped up to me and told me she was "really proud of me" for showing up in the place. As one yelper put it, "This place is about as close as it gets to the Jersey Shore here in the Pacific Northwest. At least the Asian version."